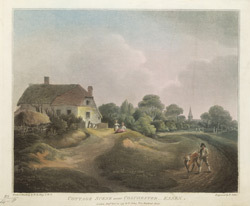 Cottage Scene Near Colchester 14-p.
bl.uk > Online Gallery Home	> Online exhibitions	> King George III Topographical Collection	> Cottage Scene Near Colchester 14-p.
Picturesque scene of a large cottage with church spire in the background near Colchester in Essex. This is one of a group of four cottage views in Essex by William Redmore Bigg A.R.A. Colchester is in north west Essex, and was about 50 miles from London.